ALPINE SWEET - Private cabin in the woods! Relax in the Hot Tub and enjoy tranquility! Plus Seasonal MTN VIEWS! Perfect for couples looking for coziness & seclusion. Located just minutes from the charming village of Helen, Ga. 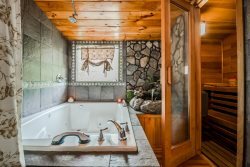 This secluded cabin offers an open floor plan with an equipped custom kitchen & granite counter tops. Also, a Gas Fireplace between the Kitchen & Living-Room adds to the ROMANCE of the cabin. Plus a game room with a mini Pool Table & a spacious porch with a HUGE HOT TUB! Alpine Sweet is the last cabin on the Mountain making it more private & more quiet than any other cabin. Kick back next to the fireplace & look out through the 17 ft tall glass windows, with seasonal views of Mt. Yonah! The Road to This Cabin is a Rough Gravel Road. A 4×4 is Recommended for This Cabin. GPS and directions from any online site are Not Accurate. Please use the directions sent to you from the office. We Are Not Responsible for Road Conditions. Dogs ALLOWED: Max limit 2 dogs. $50 Pet Fee PER Dog. Great staff, did everything online didnt even need to call in. cozy cabin, cable didnt work but we still enjoyed the stay!